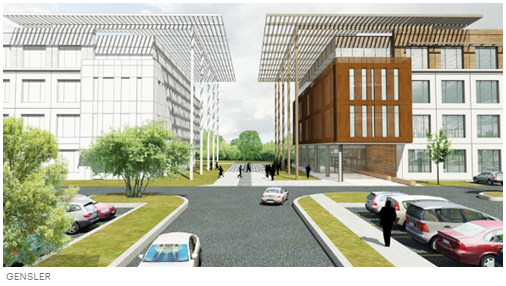 ​​​CARROLLTON – A division of global pharmacy group firm, AmerisourceBergen Corp., began work on its 32-acre corporate campus in Carrollton, with plans to employ upwards of 3,000 employees in the next decade. The initial phase totaling $113 million with 300,000 sf of space is slated to be completed in 2019. This is the first step in the divisional corporate campus—a two-phased development—becoming a reality and giving AmerisourceBergen Specialty Group a place to relocate about 1,200 existing employees to the campus in 2019. ​​Want more data? See DFW Office Market Research.